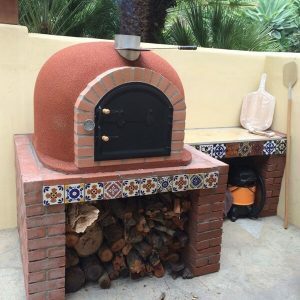 The Mediterrani Royal is considered to be well within the small number of outdoor wood fired pizza ovens that should be seen as being market leaders and for this fantastic reason, simply everything about it makes it one of the best pizza ovens that we have used to date. 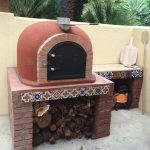 The fact that once you purchase it, the oven arrives completely assembled is a huge draw factor for many, reducing the chances of failing to allow the correct level of movement within the exterior which is a common cause of cracking, well not when you welcome the Mediterrani Royal into your garden. A true showpiece that is sure to get any gathering talking about your new feature, the Royal truly does present you with a superior level of outdoor cooking, making those friends and family gatherings even more rewarding than ever, however be ready to be named as the designated meeting point from the moment that they see that you have this little beauty ready and waiting to cook up some mouth-wateringly good food. Measuring in at 100cm square, the Mediterrani Royal of significant standing and that is something that you will have to keep in mind should you consider buying it, because with such a quality of build that makes it one of our favourite wood fired ovens available to date, it weighs plenty and could need 4-5 people to carry it to its new resting location (weighs 520KG). With such a generous size, you are presented with a huge amount of cooking space that can easily allow you to cook between 3 to 4 pizzas at a time, with space to spare should you decide that you would like to rotate any of them during the time in which they are cooking. Honestly, if you love cooking outdoors then this is the choice that you need to be looking to make as from the moment that we bought it, we spent almost three whole weeks cooking and dining ‘al fresco’ as we wanted to put the oven through its paces. Everything from chicken, pizzas and casseroles and anything in between were queued up and placed into the well-insulated cooking space found right in the heart of the oven. One more final point to also think about, with all that space due to its larger size, cleaning the oven is quick and easy too, simply grab your brush once the oven has cooled and drag the char out into an awaiting metal bin. A great example of how outdoor cooking should be done in the home and with a price that certainly justifies itself thanks to the quality that you are getting.